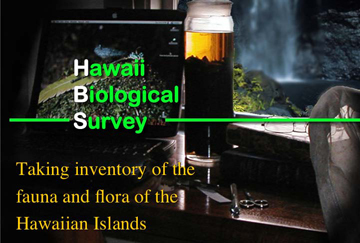 The Hawaii Biological Survey (HBS) is an ongoing natural history inventory of the Hawaiian archipelago. It was created to locate, identify, and evaluate all native and non-native fauna and flora within the state, and to maintain the reference collections of that biota for a wide range of uses. In coordination with related activities in other federal, state, and private agencies, the HBS gathers, analyzes, and disseminates biological information necessary for the wise stewardship of Hawaii’s rich natural heritage. The HBS conducts a coordinated inventory and monitoring program in assessing the overall status and trends in the abundance, health, and distribution of plants and animals, as well as the ecosystems upon which they depend. The HBS has published its annual Records of the Hawaii Biological Survey since 1994. This is the primary source of research on new island and state records of our fauna and flora. Soon after its founding in 1889, Bishop Museum established programs to study and document the plants and animals of Hawai‘i and that effort has become the largest single source of information on Hawaiian organisms. Virtually all definitive published treatments and manuals of Hawaiian organisms, beginning with Fauna Hawaiiensis in 1901, have been produced by the Museum or in close collaboration with the museum. In 1992, the Hawai‘i State Legislature recognized the Museum’s past and present activities by designating Bishop Museum as the Hawaii Biological Survey. There are approximately 17,000 terrestrial, 500 freshwater, and 5,500 marine species of plants and animals in Hawai‘i. Bishop Museum, which has the world’s largest biological collections for Hawai‘i (about 4 million specimens) is conducting field surveys to document the distribution of these organisms and is organizing information from its collections and the associated scientific literature into comprehensive computerized databases. This information will be used to assist natural resource agencies in the proper management of Hawaii’s precious and rich biota for years to come.